Join us for a discussion of The Lonely Polygamist by Brady Udall. You're invited to a discussion of The Lonely Polygamist by Brady Udall. Come and discuss The Lonely Polygamist with the First Monday discussion group! We will be meeting at Dragonfly Books on Monday, February 6th at 7:00 pm at the store. Plan to come early to visit and to shop. This is your opportunity to meet other readers in the community and to discuss some great books. No pre-registration is necessary, however it will be helpful to have read the book being discussed. 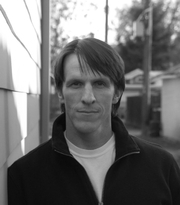 Brady Udall's book The Lonely Polygamist was available from LibraryThing Early Reviewers. Brady Udall is currently considered a "single author." If one or more works are by a distinct, homonymous authors, go ahead and split the author. Brady Udall is composed of 6 names. You can examine and separate out names.